Located in the scenic Minnesota River valley approximately 80 miles southwest of Minneapolis-St. Paul, Greater Mankato consists of Mankato and North Mankato with a combined population of approximately 54,000. Mankato, ranked 10th in the nation on the Forbes 2013 list of “Best small places for businesses and careers”, is a leader in Minnesota’s economic growth. Area businesses are well balanced between commercial, industrial and agricultural. Employment opportunities are offered in health care, education, high technology, manufacturing, printing, retail and service-related industries. 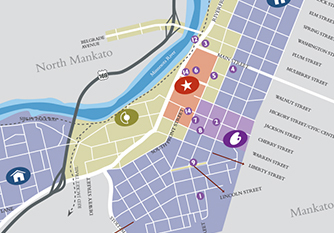 Mankato and North Mankato are home to two leading medical organizations, Mayo Clinic Health System and the Mankato Clinic, providing a wide variety of advanced services. Greater Mankato is home to several colleges and universities including Minnesota State University, Mankato, Bethany Lutheran College, South Central College and Gustavus Adolphus College. Thousands of students locally, nationally and internationally populate the area each year, providing a young and culturally rich energy. The city blends activities for all ages and interest levels. Mankato’s civic center has hosted nationally touring ice shows, music concerts and theater productions as well as supported local events. Recreational opportunities abound in the Mankato area for most sports or interests for every season of the year. The City of Mankato is renowned for great parks and trails. Rivers, lakes, ravines, bluffs, natural prairies and forested areas offer breathtaking landscapes and provide a scenic backdrop for an area steeped in historic significance.